Are Peanut Adjuvants in Vaccines Responsible for the Peanut Allergy Epidemic? Video highlights of the last Congressional Hearing on Autism. Before 1900, reactions to peanuts were unheard of. Today almost a 1.5 million children in this country are allergic to peanuts. But reactions to peanuts are not just another allergy. Peanut allergy has suddenly emerged as the #1 cause of death from food reactions, being in a category of allergens able to cause anaphylaxis. This condition brings the risk of asthma attack, shock, respiratory failure, and even death. Primarily among children. But let’s back up a little. We have to look at both vaccines and antibiotics in recent history, and the physical changes the ingredients in these brand new medicines introduced into the blood of children. Before 1900, anaphylactic shock was virtually unknown. The syndrome of sudden fainting, respiratory distress, convulsions, and sometimes death did not exist until vaccinators switched from the lancet to the hypodermic needle. That transformation was essentially complete by the turn of the century in the western world. Right at that time, a new disease called Serum Sickness began to afflict thousands of children. A variety of symptoms, including shock, fainting, and sometimes death, could suddenly result following an injection. Instead of covering it up, the connection was well recognized and documented in the medical literature of the day. Dr Clemens Von Pirquet, who actually coined the word “allergy,” was a leading researcher in characterizing the new disease. Serum Sickness was the first mass allergenic phenomenon in history. What had been required for its onset, apparently, was the advent of the hypodermic needle. Von Pirquet recognized that vaccines had 2 primary effects: immunity and hypersensitivity. He said they were inseparable: the one was the price of the other. In other words, if we were going to benefit from the effects of mass immunization, we must accept the downside of mass hypersensitivity as a necessary co-feature. Modern medicine has decided that this double effect should be kept secret, so they don’t allow it to be brought up much. Many doctors in the early 1900s were dead set against vaccines for this precise reason. The advertised benefit was not proven to be worth the risk. Doctors like Walter Hadwen MD, Wm. Howard Hay, and Alfred Russell Wallace saw how smallpox vaccines had actually increased the incidence of smallpox. [2,3] Wallace was one of the principal epidemiologists of the age, and his charts showing the increase in smallpox death from vaccination are unassailable – meticulous primary sources. Another landmark researcher of the early 1900s was Dr Charles Richet, the one who coined the term anaphylaxis. Richet focused on the reactions that some people seemed to have to certain foods. He found that with food allergies, the reaction came on as the result of intact proteins in the food having bypassed the digestive system and making their way intact into the blood, via leaky gut. Food anaphylaxis is altogether different. This sudden, violent reaction requires an initial sensitization involving injection of some sort, followed by a later ingestion of the sensitized food. Get the shot, then later eat the food. The initial exposure creates the hypersensitivity. The second exposure would be the violent, perhaps fatal, physical event. Next up was penicillin, which became popular in the 1940s. It was soon found that additives called excipients were necessary to prolong the effect of the antibiotic injected into the body. The excipients would act as carrier molecules. Without excipients, the penicillin would only last about 2 hours. Refined oils worked best, acting as time-release capsules for the antibiotic. Peanut oil became the favorite, because it worked well, and was available and inexpensive. Allergy to penicillin became common, and was immediately recognized as a sensitivity to the excipient oils. To the present day, that’s why they always ask if you’re allergic to penicillin. The allergy is a sensitivity to the excipients. By 1953 as many as 12% of the population was allergic to penicillin. But considering the upside with life-threatening bacterial infections, it was still a good deal – a worthwhile risk. By 1950 antibiotics were being given out like M&Ms. Soldiers, children, anybody with any illness, not just bacterial. Despite Alexander Fleming’s severe warnings against prophylactic antibiotics, antibiotics were given indiscriminately as the new wonder drug. Just in case anything. Only then, in the 1950s, did peanut allergy begin to occur, even though Americans had been eating peanuts for well over a century. Remember – just eating peanuts cannot cause peanut allergy. Except if they are allowed to become moldy of course, in which case aflatoxins are released. But that’s really not a peanut allergy. When peanut allergy did appear, the numbers of cases were fairly small and initially it wasn’t even considered worthy of study. The big change came with vaccines. Peanut oils were introduced as vaccine excipients in the mid 1960s. An article appeared in the NY Times on 18 Sept, 1964 that would never be printed today. The author described how a newly patented ingredient containing peanut oil was added as an adjuvant to a new flu vaccine, in order to prolong the “immunity.” The oil was reported to act as a time release capsule, and theoretically enhanced the vaccine’s strength. Same mechanism as with penicillin. By 1980 peanut oil had become the preferred excipient in vaccines, even though the dangers were well documented. It was considered an adjuvant – a substance able to increase reactivity to the vaccine. This reinforced the Adjuvant Myth: the illusion that immune response is the same as immunity . The pretense here is that the stronger the allergic response to the vaccine, the greater will be the immunity that is conferred. This fundamental error is consistent throughout vaccine literature of the past century. Historically, researchers who challenged this Commandment of vaccine mythology did not advance their careers. The first study of peanut allergies was not undertaken until 1973. It was a study of peanut excipients in vaccines. Soon afterwards, and as a result of the attention from that study, manufacturers were no longer required to disclose all the ingredients in vaccines. What is listed in the Physicians Desk Reference in each vaccine section is not the full formula. Same with the inserts. Suddenly after 1973, that detailed information was proprietary: the manufacturers knew it must be protected. Intellectual property. So now they only were required to describe the formula in general. Why was peanut allergy so violent? Adjuvant pioneer Maurice Hilleman claimed peanut oil adjuvants had all protein removed by refining. The FDA disagreed. They said some peanut protein traces would always persist - that even the most refined peanut oils still contained some traces of intact peanut proteins. This was the reason doctors were directed to inject vaccines intramuscular rather than intravenous – a greater chance of absorption of intact proteins, less chance of reaction. But all their secret research obviously wasn’t enough to prevent sensitivity. Mother Nature bats last: no intact proteins in the body. Put intact proteins, peanut or whatever, for any imagined reason into the human system and the inflammatory response will fire. And since the goal of oil emulsion adjuvants was to prolong reactivity in the first place – the notion of time-release – this led to sensitization. It would be imprudent enough to feed peanuts to a newborn, since the digestive system is largely unformed. But this is much worse – injecting intact proteins directly into the infant’s body. In 36 vaccines before the age of 18 months. A new kind of anaphylaxis appeared with peanut reactions: reverse anaphylaxis. (p 172, ) The reaction was not only to the sensitizing antigen, but to the weird new antibodies that had just been introduced in the human species by the new antigen. As vaccines doubled between the 1980s and the 1990s, hundreds of thousands of kids were now exhibiting peanut sensitivities, with frequent cases of anaphylaxis reactions, sometimes fatal. But nobody talked about it. Following the next enormous increase in vaccines on the Mandated Schedule after 9/11, whereby the total shot up to 68 recommended vaccines, the peanut allergy soon reached epidemic proportions: a million children: 1.5% of them. These numbers fit the true definition of epidemic even though that word has never been used in mainstream literature with respect to peanut allergy, except in Fraser’s odd little book. But with the newfound research, the medical profession will do what they always must do – bury it. Protect the companies. So no money will be ever allocated from NIH to study the obvious connection between vaccine excipients and peanut allergy. That cannot happen, primarily because it would require a control group – an unvaccinated population. And that is the Unspoken Forbidden. Same line of reasoning that has prevented Wakefield’s work from ever being replicated in a mainstream US clinical study. No unvaccinated populations. Which actually means no studies whose outcome could possibly implicate vaccines as a source of disease or immunosuppression. Vaccines as a cause of an allergy epidemic? Impossible. Let’s definitely not study it. Evidence for the connection between peanut excipients and vaccines is largely indirect today, because of the circling of the wagons by the manufacturers. It is very difficult to find peanut excipients listed in the inserts and PDR listings of vaccines. Simple liability. So in addition to all the other problems with vaccines delineated in our text, now we have a new one – peanut oil excipients. Which all by themselves can cause severe, even fatal, episodes of shock, as well as chronic allergy – irrespective of the mercury, aluminum, formaldehyde, ethylene glycol, and the attenuated pathogens which the manufacturers do admit to. Childhood allergies doubled between 1980 and 2000, and have doubled again since that time. Theories abound. Childhood vaccines doubled at the same time. Why is there a virtual blackout of viable discussion about this glaring fact? The epidemic of peanut allergy is just one facet of this much broader social phenomenon. We have the sickest, most allergic kids of any country, industrialized or not, on Earth. A study of the standard literature of vaccines is identical to a study of the history of adjuvants – an exercise in cover-up and dissimulation. Unvaccinated children don’t become autistic. And they don’t go into shock from eating peanuts. 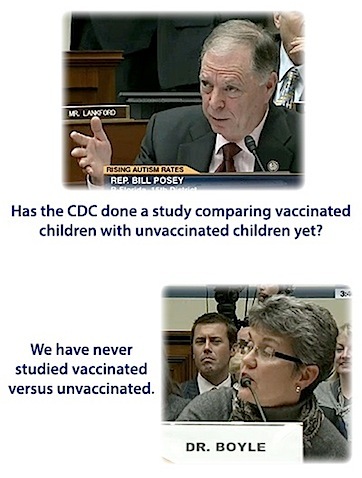 But there can never be a formal clinical study where the control group is unvaccinated. NIH would never do that. They cannot. They know the outcome. in influenza vaccines Postgraduate Medical Journal March 1973 , no. 49, p 180. 9. Technical Report # 595, Immunological Adjuvants, World Health Org. 1976. This page contains a single entry by sal published on March 19, 2013 10:15 AM. Parental Fears Toward HPV Vaccines Is Growing was the previous entry in this blog. Vaccine Law Threatens Parental Rights for ‘the Greater Good’ is the next entry in this blog.